Morning of day nine started in good spirits, after an excellent meal the night before at El Brunos in Cuba, shared with Fritz, another rider from Colorado who we had met at the Toaster House a couple of days before. 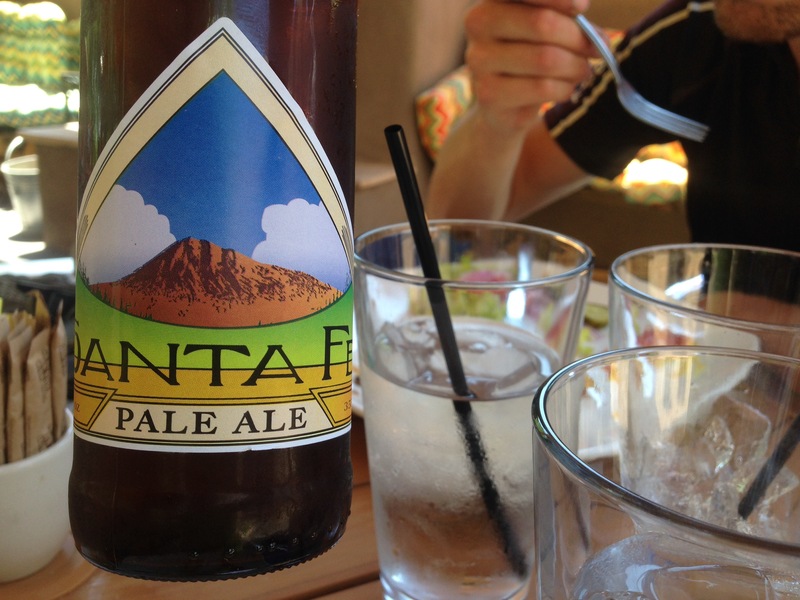 First on tarmac, climbing up into the Santa Fe forest felt so different again to the barren landscape further south. 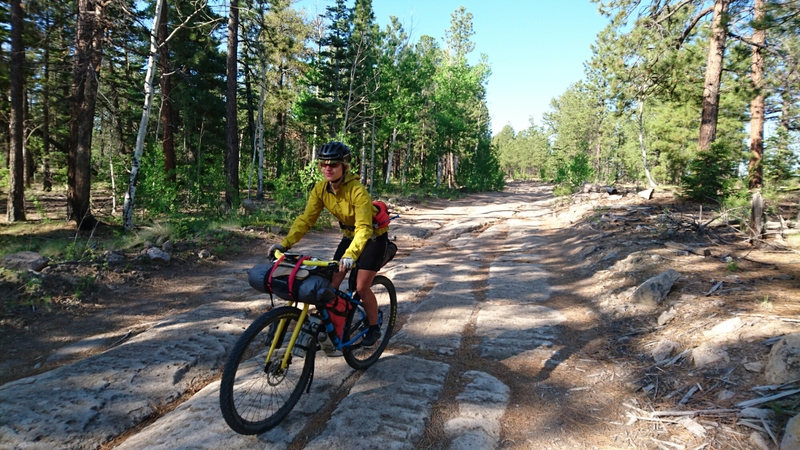 After about 10 miles we turned off the ‘pavement’ (road can still mean offroad to the Americans) onto gravel forestry tracks which gradually felt more and more like we were in the Alps. There were streams running here and there which eased the constant worry of whether our own supply would be enough, and things had cooled down a bit as we climbed up. This carried on for several hours as we made our way up to around 3100m, far higher altitude than either of us had ridden at before, but the terrain was also getting more and more rocky as we went. For the first time I felt like we were actually ‘mountain biking’, having to pick lines though steep boulder strewn ascents on a 30kg bike was no easy task. We were getting pretty tired by this point and with a storm rolling in and a 4×4 driver telling us to watch out for the loose bull up ahead, we had had enough for the day. Thankfully the rain, and the bull, held off and we made it 55miles to a reasonable camp spot just over the peak. We woke on day 10 with a big bowl of porridge and the thought of a long downhill awaiting us as we set off. The track was fairly smooth at first, but after a mile or so started getting more and more broken up, reminiscent of the wide but challenging descents of the Peak District back home. 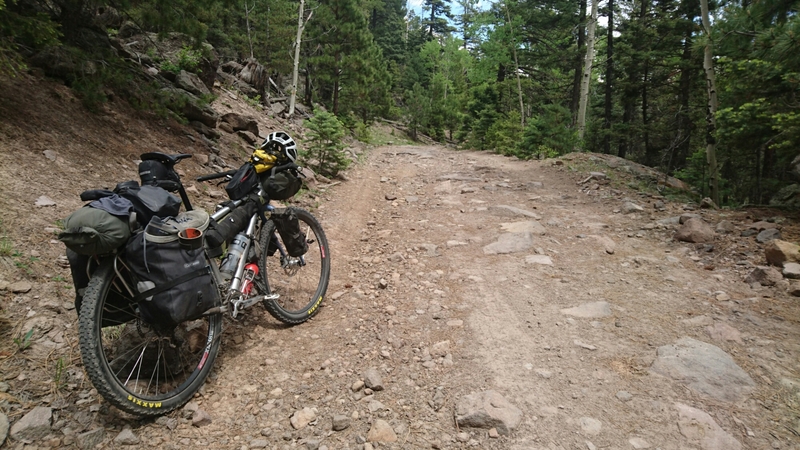 My panniers were constantly rattling around and the need to stop and tighten straps every few minutes took the shine off a bit, but it was great to have some variation in the riding! 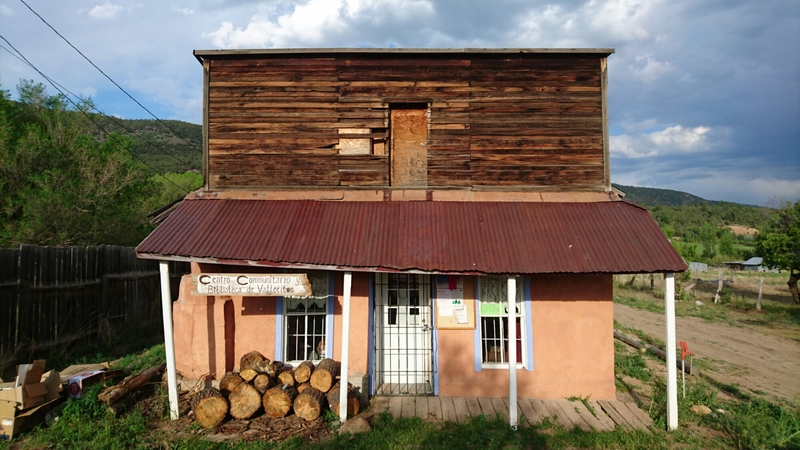 After 25 miles we stopped in Abiquiu, a small village with a petrol station and a restaurant, the Abiquiu Inn. I had been feeling more hungry than usual over the past few days, my energy levels dropping as I burnt more calories than I was managing to put in, so the delicious burger, fries, and cake helped get me back on track. 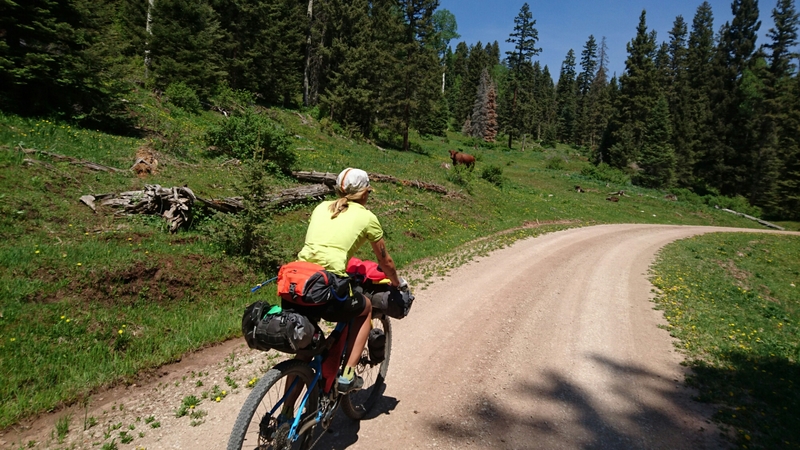 Next it was on to El Rito via tarmac, then back onto another gravel climb to Vallecitos, where we hoped to camp for the night. 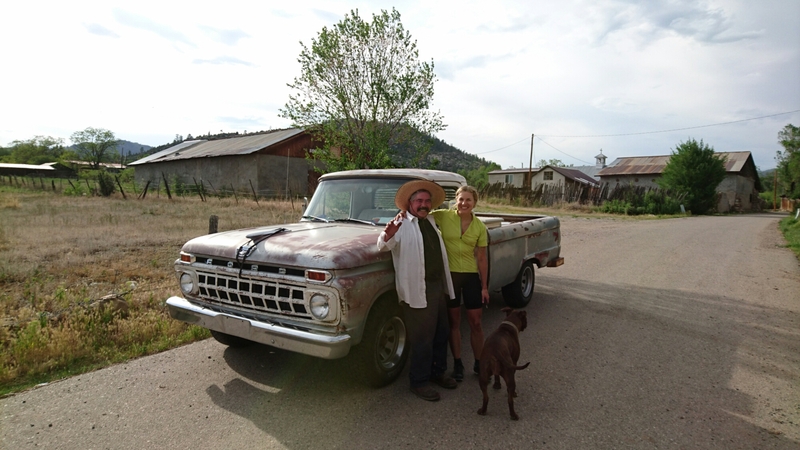 After 54 miles for the day we rolled into town to be met by Arnold in his 1965 Ford Truck. I’d been amazed throughout New Mexico by the amount of older cars on the road, and Arnold’s had a certain charm to it. He met us outside the community centre, and on enquiring as to where we were staying, pulled out his keys and let us in for the night! So that’s where I am now, unfortunately the town has seen better days and the centre is in need of some work, but there’s WiFi, no need to put the tent up, and the locals kindness has once again shown to be amazing! A rat has just shot down the stairs in front of me, perhaps it’ll eat the mosquitos that sneaked in? I bought a map of the west USA and highlighting your route. also google maping . Phew it does look very desolate close up!. i’m glad you are meeting up with good people.I bet those beers taste good at the end of the day. Haha! I did exactly the same! I’ve been reading loads of blogs and twitter feeds of folk riding Ht550 and North coast 500. I feel I need to know about your Rigg. Hi Yasmin, I’ve just written a post about our setups called ‘all the gear’ have a read!